Michaela Dorfmeister wrote her own page in the Olympic history books at Turin in 2006 when she brought the curtain down on a glittering career with an unprecedented super-G/downhill double, a feat never achieved before by man or woman. A few weeks later, the Austrian champion left her competitive skis on the rack for good as she quit the sport at 33 with a list of honours that included three Olympic medals (2 gold, 1 silver) and four world podiums (2 gold, 1 silver, 1 bronze). On top of that, she racked up five World Cup crystal globes (2 downhill, 2 super-G, 1 giant), not to mention the overall title in 2002 plus 25 World Cup victories. A fine return for the girl from Vienna who flirted with the best in the business before finally landing her first major honour in 2001 at the world championships at Sankt Anton when she raced to the downhill gold in an all-Austrian podium that included Renate Gotschl and Selina Heregger. This was the second consecutive Austrian sweep of the downhill podium at the world championships after Vail in 1999 although in that race Dorfmeister settled for second place behind Gotschl. One year earlier, she picked up her first Olympic medal when she landed silver in the super-G at Nagano in 1998. After the big breakthrough in 2001 and the big disappointment of the Salt Lake Games in 2002 where she failed to pick up a medal of any colour, she showed her bounce-back-ability, however, producing some of her best skiing, after that comparative disaster, to finish the 2002 season as overall World Cup champion. At the 2003 world championships in St. Moritz, she was again at the summit somewhat surprisingly winning the super-G gold as the so-called favourites fell by the wayside. Dorfmeister, pipped to the 1998 Olympic super-G title by Picabo Street by 0.01sec, took revenge on the United States in some style as she saw off US pair Kirsten Clark and Jonna Mendes. 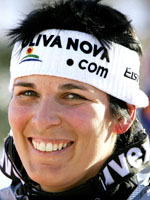 She also won her first overall downhill title in 2003 edging Gotschl in a close race that also featured French Olympic champion Carole Montillet. Dorfmeister started 2005 with a poor world championships, crashing out while trying to defend her world super-G title at Santa Caterina, but quickly bounced back to form to win her first super-G title, wrapping up the crystal globe with a win in the last race of the season. For her swan song at the age of 32, she went out in style with a dazzling show which reaped her the unprecedented double gold triumph at the Turin Games and left the Olympics as the Queen of the Games.